TACLOBAN CITY – In accordance with the instruction of President Benigno Simeon C. Aquino III ordering all government agencies not to use his name or image on government programs and projects, the DPWH has revised the implementing guidelines on DPWH signboard structures which should now only contain the name of the project and location, contractor, the date when it started, and the project's completion. This means that the names and pictures of any officials will no longer appear on billboards of the Department of Public Works and Highways infrastructure projects all over the country, as gathered from a story posted at the DPWH website. DPWH Secretary Rogelio L. Singson issued Department Order 37 directing implementing offices of the agency namely Regional, District Engineering and Project Management Offices to adhere to the revised DPWH Standard Project Billboard format banning the use of name or image of any personages including the President in the project billboard. Based on newspaper reports, P-NOY has ordered his Cabinet and heads of government agencies and Government Owned and Controlled Corporations (GOCCs) to refrain from associating the President's personality and identity in their programs and projects and advised not to put up tarpaulins, billboards, and other propaganda materials bearing his name and image. Under the DPWH modified format, project billboards containing name of project and location, name of contractor, date started contract completion date, contract cost, construction consultant, implementing office (of the DPWH), and source of fund shall be installed in all project sites by the concerned implementing offices of DPWH for the information and guidance of the taxpaying public. DPWH standard billboard measuring 4 feet x 8 feet using ½ inch marine plywood or tarpaulin posted on 3/16 inch marine plywood are installed at beginning and end of road, bridge and flood control projects and in front of project site for building projects like school building, multi-purpose center, and government offices. For road projects with length of 10 kilometers or more, billboards are required to be installed at every 5 kilometers interval. It has been the practice in the DPWH to put up project billboards or tarpaulins bearing the name and image of the President, Public Works officials, and local officials who were supposed to be behind the construction of the roads and bridges. But the system has spawned criticism from the public who say the politicians are taking credit away from the taxpayers who are actually the ones paying for the infrastructure projects through their taxes payment. The general public are also encouraged to report to DPWH any concern or complaint about the infrastructure project by sending message to DPWH TEXT 2920 or call the hotline number 536-3477 and 302-9196. TACLOBAN CITY – The Bureau of Internal Revenue in Eastern Visayas, for its P2,115,973,991.31 over-all collections during the first semester of 2010, ranked number one among 19 Revenue Regions in the country, for an increase of 43.28% or 639.12 Million in revenues compared to Jan-June 2009. Moreover, the BIR in Eastern Visayas, for its excess of P488.75 Million or 30.04%, place second, in terms of increase compared to its 2010 collection goal. These good rankings were confirmed during the just concluded Command Conference held at the BIR National Office attended by all Regional Directors bureau-wide which coincided with the 106th BIR Anniversary celebration. It is interesting to note that since Tax Year 2003 up to this year, Revenue Region in Eastern Visayas has consistently landed top rankings for exceeding its revenue goals, BIR Regional Director Alert B. Alocilja said. With this commendable feat, Regional Director Alocilja shares the accolades with all his six (6) Revenue District Officers and their hard-working staff, together with his equally supportive and dedicated regional officials and personnel, but most of all, the taxpaying public, particularly, the recently awarded Top Taxpayers, for their continuous support and cooperation thru their voluntary compliance, correct and timely tax payments. Director Alocilja also extends his gratitude to BIR partners, among others, the PICPA, LCCI, IBP, NGAs, LGUs, the PIA Region 8 with broadcast and print media for their untiring cooperation and assistance in the Region’s collection efforts and in the implementation of the Bureau’s tax regulations and related programs. TACLOBAN CITY – The Armed Forces of the Philippines (AFP) and the Philippine National Police (PNP) had sought the support of the Local Government Units (LGU) to counter the insurgency problems in Leyte particularly in the municipalities of Abuyog, Burauen and Carigara during the Executive Committee meeting of the Provincial Peace and Order Council (PPOC) Chaired by Governor Jericho Petilla and presided by Hon. 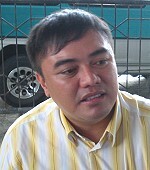 Rolando Piamonte, Jr. held on August 09, 2010 at the Leyte Provincial Capitol, Tacloban City. Lt. Col. Roberto Capulong, 19th IB Phil. Army, Commanding Officer, informed that they had encountered members of the New Peoples Army (NPA) in the municipalities of Abuyog, Burauen and Carigara which are the favorite areas considering there strategic locations and there remoteness, the residents can be easily brain washed by the promises initiated by the rebels. Lt. Col. Capulong bared that in their recent raid in one of the camps of the rebels in one of the remote barangays in Carigara, Leyte they recovered documents showing the amounts collected during the recent national election which was perceived as Permit to Campaign (PTC) or Permit to Win (PTW), but he declined to name names for intelligence monitoring and validation. Lt. Col. Capulong futher said that he was surprised when his men recovered many food items stocked by the rebels in the camp, which he concluded that this was obtained from the months of June, July and August after the election. Meanwhile, Chief Supt. John Q. Sosito, PNP Leyte Provincial Director, said that the AFP/PNP presence and successful operations provide temporary solutions only, winning the hearts of the inhabitants which is the work of the LGU concern by eradicating injustice, lessening poverty by providing livelihood programs will somehow ease the economic burden these people are experiencing and will provide sustainable solutions to the problem. Chief Supt. Sosito appealed to the Mayor’s in Leyte to increase the average allocation of only 77 liters per month in order to immediately do their work by responding promptly to areas of concern. In another development, Police Insp. Mannico C. Acorda, Operations Officer of the Criminal Investigation and Detection Group (PNP-CIDG 8) informed the PPOC Executive Committee, that 456 kgs. of cocaine bricks had so far been recovered and there are still 1,544 kgs. of cocaine bricks that are still missing for they had estimated that a total of 2 tons or 1,000 kgs. of cocaine bricks had been thrown by the foreign vessel to avoid detection by Philippine authorities. MAASIN CITY – The new Pag-IBIG law, or Republic Act 9679, is empowering the powerless. A household help, for instance, who wishes to be covered by Pag-IBIG, and granting he/she worked with a generous employer, can be a member with only a certificate from her employer as proof of employment, and no other documentary requirements like being an SSS member. This was one of the points duly discussed by Paul Talacay, Assistant Regional Manager for Operations of the Pag-IBIG Fund, during the Fund Forum held Monday at the Supercha Restaurant, this city. To really reach out for a much wider coverage, the new law has lowered the threshold of mandatory coverage to Pag-IBIG Fund, from a monthly income of P4,000 to at least P1,000 a month, Talacay said. Eligible to be covered under this new set-up are those workers belonging to the informal sector of society, which are classified as self-employed, including professionals, single proprietors, news reporters who are not under employer-employee relationship. Also falling under this category are professional athletes, coaches, trainees, jockeys, farmers and fisherfolks, cigarette vendors, watch-your-car boys, and household helpers. For this group of newly identified would-be Pag-IBIG members, the conventional documents that normally required to be attached were no longer needed, except basic personal information, Talacay said. Also around at the Fund Forum explaining the features of the new law were Jennelyn Baretta, in-charge of Marketing and Enforcement, and two other key staff from the Regional Office. Representatives from public and private employers, some bookkeepers, and members of the local media attended the activity. Earlier, at the city hall lobby, a launching of the Pag-IBIG service desk was held in close coordination with the city government, Baretta reported. Pag-IBIG used to maintain a branch office in the city three or four years ago, but it was closed for too much overhead costs. With the new law, a need for a service desk cropped up again, wherein every third week of the month, from Wednesday to Friday, a personnel will be assigned to cater to queries and other needs of the members. TACLOBAN CITY – Mayor Neil M. Alvarez of Oras town emerged unopposed to become the new president of the League of Municipalities of the Philippines Eastern Samar Chapter. This was learned from Leyte Board Member Roque A. Tiu who represented the League of Municipalities of the Philippines National Board in the election meeting held on August 9, 2010 at the DILG Eastern Samar Provincial Office at Borongan City. DILG Provincial Director Manuel Lagrimas was present during the meeting which was presided by outgoing LMP Eastern Samar president Javier Zacate, Board Member Tiu said. As the Eastern Samar LMP president, Mayor Alvarez will represent the Chapter in the National Board. He will also represent the interests of the municipalities of Eastern Samar in the Regional Development Council, among others. Together with Mayor Alvarez, other officers of the LMP Chapter who were elected included Quinapondan Mayor Nedito Campo as Vice-President. Elected as secretary general was Sulat Mayor Virginia R. Zacate while General MacArthur Mayor Jaime S. Ty was elected as the Treasurer. San Policarpo Mayor Conrado U. Nicart III was chosen as the Auditor while Maydolong Mayor Henry Afable was chosen as PRO and Executive/Legislative Liaison. Chosen as member of the Board were Arteche Mayor Rolando Evardone; Balangiga Mayor Viscuso de Lira; Llorente Mayor Tito Codoy; Dolores Mayor Emiliana Villacarillo; Can-avid Mayor Alicia Cesista, and Salcedo Mayor Melchor Gagante. Board Member Tiu said that the election of the LMP Eastern Samar Chapter is the fifth conducted in Eastern Visayas. Only the LMP Samar Chapter has not elected its new set of officers yet, Board Member Tiu added. CATBALOGAN CITY – Catbaloganon farmers have been in awe these days due to the almost miracle developments they have witnessed in ‘Greenhouse’ farming. The greenhouse farm in Catbalogan is located in San Vicente, Catbalogan. In a talk with Agriculture Regional Director Leo Cañeda, during the opening of the Bahandi han Samar agro-trade fair in Catbalogan City, he said that per structure costs at least some P180,000 with the department shouldering the amount. Some 20 farmers from New Mahayag and its environs have enrolled in the comparative study of two farms; one is exposed to the elements called the open field while the other is inside a greenhouse. The East-West Company, a multinational seed producer teaches the farmers the new technology to apply in the training. Greenhouses are designed to protect tender or out-of-season plants against extreme cold or heat. Catbalogan City Agriculturist Ruth Dasal said the greenhouses provide economical means of preventing pests and diseases from destroying high-value crops and vegetable planted within the greenhouse. The Greenhouse project in Cabalogan, according to Cañeda will try to produce lettuce, cauliflower and broccoli, plants that have been successfully grown in Ormoc, Maasin and Calbayog City. In Samar, Dasal said some greenhouses are in Calbayog and Sta Rita. The training, according to Dasal’s assistant Daniel Daguman, is a step-by-step management of the farm – the organic way. The greenhouse has been established made of light, plastic materials and stainless steel tubes. It stands on a 3x18 meter lot with other furnishing needed for the growing of high-value crops and vegetables. The local implementation of the technology underwent experimentation and trial period as agriculture technicians found it hard to adopt the said technology during its initial stage. For farmers to see the difference, an open farm has also been established in a 1x15 lot, Daguman added. Here they grow pechay, mustards, lettuce and ampalaya. BORONGAN, Eastern Samar – Sol Angeli E. Libanan, 24, wins one seat in the Sangguniang Panlalawigan (SP) in the recently held Provincial Councilors League (PCL) elections. Garnering 164 votes of the total 230 registered PCL members, the young Libanan who sits as Sangguniang Bayan member of Taft LGU expressed relief after the tough electoral battle. The charming, slim lady legislator, who is “Bisol” to family and friends, plans to encourage her colleagues to harness further their knowledge and education, as an important tool in their line of work. She added that she plans to bring them to other LGUs in the country for study tours because she believes traveling is also a way of learning. Board Member Bisol chairs the SP Tourism Committee which is fitting to her educational preparation having finished the diploma Course in HRM and Tourism at the London International Hotel Management and English School. For her bachelor’s Degree, she graduated a Business Management Course, major in International Business at the SouthVille Foreign College in Las Pinas City. Asked to comment on SPM Libanan’s victory at the SP, Governor Conrado Nicart Jr. said he was happy about it, because she can help him in the exercise of his duties and responsibilities particularly in the deliberation of appropriation ordiancnes for projects which will be submitted by the Executive Department. SPM Libanan is the daughter of former Congressman and now Immigration Commissioner, Marcelino Libanan and wife Elda. TACLOBAN CITY – The Regional Minerals Development Council 8 is scheduled to hold a Mining Forum for all stakeholders in the mining industry on August 18, 2010 from 8:00 o’clock in the morning to 5:00 o’clock in the afternoon at the Ritz Tower de Leyte, Tacloban City. Mines and Geo-Sciences Bureau Region 8 Director Roger de Dios, Vice-Chair of the Council, informed that also included in the Mining Forum are the Local Government Units, Non-Government Organizations, Church and academe. Director De Dios said that the Forum hopes to provide information on the updates and developments in the mining industry of the Region. It also aims to present the mineral potentials of Eastern Visayas and to discuss the salient features of the Philippine Mining Act of 1995 and its revised implementing rules and regulations. The Mining Forum also hopes to address mining issues and concerns besetting the mining industry in order to erase any doubts and misconceptions on mining. As a backdrop for better enforcement of mining laws, such engagement is necessary to involve all stakeholders in order to make the conduct of the Forum, more meaningful, Director De Dios said. “It is our belief that the promotion of the mining industry has to be won intellectually, environmentally, socially and economically,” Director De Dios added. No less than DENR Secretary Ramon J.P. Paje, Jr. has been invited to give the keynote address. A short message will also be given by MGB Director Edwin G. Domingo. Among the topics included to be discussed during the Forum are The Salient Features of the Philippine Mining Act by Director Roger de Dios; Minerals Endowments in Eastern Visayas by Mr. James S. Leones, Chief Geologist of MGB-8; the Situationers of Mining in Easternn Visayas by Ms. Nonita Caguioa, OIC, Mining Operations Officer of MGB-8; and The Exploration Program of PMPCI by Mr. Jose S. Garda, vice president for exploration. A Press conference is set to be conducted at 10:00 o’clock in the morning at another venue within the Ritz Tower de Leyte, Director De Dios said. In the afternoon, the topics that will be tackled are the Complementary Roles of Local Chief Executives in the Implementation of Mining Laws Rules and Regulations by Mr. Pastor Salazar, attorney III of MGB-8; Knowing the Minerals Development council by an MDC Representative; and the Geohazards Assessment in Region 8 by Mr. Ricardo Obtinalla, Supervising Geologist of MGB-8. TACLOBAN CITY – Ms. Janeth Morata Fuentes of the Philippine Science High School - Eastern Visayas Campus in Palo, Leyte is among this year’s Most Outstanding Teachers in the secondary level. Ms. Morata was recently in the limelight for being the Adviser of the PSHI-Eastern Visayas Campus students who were winners of the recently held Intel International Science and Engineering Fair, the world’s largest pre-college science fair competition which was attended by one thousand and six hundred eleven (1,611) high school students from over 59 countries. Metrobank Foundation President Aniceto Sobrepeña recently announced that a total of eight public school teachers from the elementary and secondary levels – including two professors from the University of the Philippines-Diliman and De La Salle University – emerged as winners in this year’s Metrobank Foundation Search for Outstanding Teachers. Aside from Ms. Janeth Fuentes of the Philippine Science High School - Eastern Visayas Campus in Palo, Leyte, the other awardees for the secondary category, were Mercidita Villamayor of the Bukidnon State University - Secondary School Lab in Malaybalay City; Estrelita Peña of the Kabasalan National High School in Kabasalan, Zamboanga Sibugay; and Mercelita Labial of the Xavier University High School in Cagayan de Oro City. The awardees for the elementary category include Grace Salvatus of the Municipal Sector Elementary School in Calauag, Quezon; Miladith Polutan of the Oroquieta City Central Elementary School in Oroquieta City; Conchita Ibarondo of the San Antonio Elementary School in Iriga City; and Nancy Aquino of the Mlang Pilot Elementary School in Mlang, Cotabato. For the higher education category the awardees were Dr. Rowena Cristina Guevara of the University of the Philippines - Diliman, and Dr. Raymund Sison of De La Salle University. “This search continues to bestow honor upon the teaching profession by according special recognition to teachers who manifest profound commitment to the development of the youth, through exemplary competence, remarkable dedication to their work, and an effective educational leadership,” Sobrepeña pointed out. The 2010 Outstanding Teachers will be honored with gold medallions by President Benigno Simeon C. Aquino III in Malacañang. They will also receive plaques and cash amounting to P300,000 each during the formal awarding ceremonies at the Metrobank Plaza on Gil Puyat Ave. (formerly Buendia Ave.) in Makati, which will serve as the highlight of the 48th anniversary celebration of the Metropolitan Bank & Trust Company on September 3. TACLOBAN CITY – Eastern Samar Governor Conrado Nicart stressed that he will not tolerate anyone doing illegal activities, especially cocaine-pushing or drug pushing. “When I say anyone, it includes relatives and friends and province-mates,” Governor Nicart said in a phone patch with the Philippine Information Agency in Region 8. The Governor said that Arnold Nicart’s father is a member of the Sangguniang Bayan of San Policarpo while his mother is a barangay chairman of Barangay Baras. The family of Arnold Nicart is not an ally of the Governor because in the last election, they endorsed and helped the Governor’s opponent. “When the two-ton shipment of cocaine bricks were dumped into the sea off Samar by sailors aboard the Chinese vessel King Yue I in December 2009, I was not yet Governor, nor was I holding any political position in Eastern Samar,” Governor Nicart said. Governor Nicart is known to be supportive of the Philippine National Police, the Philippine Drug Enforcement Agency and the Anti-Illegal Drugs Special Operations Task Force (AIDSOTF). In fact, he even pledged to give an incentive of P1,000 for every cocaine brick that will be voluntarily surrendered to the PNP. He said that even if the deadline which is July 28, have expired, he gave the assurance that he will still help those who would like to surrender cocaine. Several national broadsheets carry the story of the Eastern Samar Governor’s nephew and two others who were arrested in the act of selling cocaine brick for P1Million, in a drug bust operation. Deputy Director General Perfecto Palad, commander, identified the suspects as Jackson Garlejo, Ariel Bacolor and Arnold Nicart, said to be a nephew of Eastern Samar Gov. Conrado Nicart. According to Gen. Palad, Aidsotf agents first arrested Garlejo and Bacolor in the Club Filipino parking lot in Greenhills, San Juan City, at around 9:30 a.m. after they offered to sell the cocaine brick for P1 million to an anti-narcotics agent posing as a buyer. Supt. Leonardo Suan, operation leader, reported to Gen. Palad that under questioning, the suspects pointed to Arnold Nicart as the alleged owner of the drugs and said that he was waiting for them to deliver the money. Garlejo then texted Nicart for the payoff. Nicart was arrested as he received the money outside a restaurant in front of the GMA-7 network building along Timog Avenue. Supt. Suan said Nicart’s father was a first cousin of the governor. However, “We believe the good governor is not involved in this because he has been very active and supportive in recovering the shipment that was dumped last December. He has no control over what his relatives are doing,” Supt. Suan said. Supt. Suan was referring to the two-ton shipment of cocaine bricks that were dumped into the sea off Samar by sailors aboard the Chinese vessel King Yue I in December 2009. The ship was en route to Hong Kong from Ecuador when the crew supposedly received a tip they were under surveillance by the US Drug Enforcement Agency.